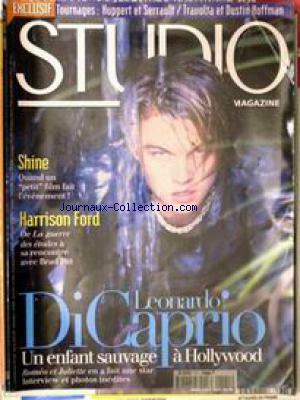 LEONARDO DI CAPRIO - UN ENFANT SAUVAGE A HOLLYWOOD - ROMEO ET JULIETTE EN A FAIT UNE STAR. TOURNAGE - HUPPERT ET SERRAULT - TRAVOLTA ET DUSTIN HOFFMAN. HARRISSON FORD - DE LA GUERRE DES ETOILES A RENCONTRE AVEC BRAD PITT. SHINE - QUAND UN - PETIT - FILM FAIT L'EVENEMENT.